gnetha Åse Fältskog was born on April 5th, 1950, in the southern Swedish town of Jönköping. Not even her parents, Ingvar and Birgit, could have predicted the fame their daughter would eventually achieve. Agnetha's father opened a door that would eventually lead to stardom. Ingvar Fältskog loved the local amateur dramatic society and often put together shows for the local community. In 1956, he organized a Christmas show that was Agnetha's stage debut. During her singing of the song, Billy Boy, an unfortunate but hilarious incident happened to Agnetha, her pants fell down! This did not discourage Agnetha at all, she had been taking piano lessons and was becoming quite good. She started to compose songs at an early age. She also played at a local church. At the age of thirteen, Agnetha with two of her friends, Lena Johansson and Elisabeth Strub, began singing and performing locally. They were called The Cambers. Agnetha idolized American singer, Connie Francis, and loved her style of music. At age 15, Agnetha decided to leave school and pursue a career. She worked as a telephonist for a car firm while performing with a local dance band, headed by Bernt Enghardt. The band became so popular that Agnetha had to make a choice, her job or to continue singing with the band. She continued to sing with the Bernt Enghardt band for two years. It was during this time that she broke up with her boyfriend, Björn Lilja. This event inspired her to write a song that would soon catapult her to fame, Jag var så kär. She sang this song with the Enghardt band and it soon was a favorite request for the audience. A member of the band had a relative named Little Gerhard (Karl Gerhard Lundkvist). He in his own right had become a very big rock'n'roll star, but had retired and now was a producer at Cupol Records. Bernt sent a recording demo of the band. Two things impressed Little, Agnetha's song and her voice. Agnetha had some misgivings because Little was not interested in the band and they were not to be included on the record. During the autumn of 1967, Agnetha and her father boarded a train and were on their way to Phillip Recording Studio, Stockholm. For the first time in her life the shy and nervous Agnetha could not believe what was happening to her. As she went down the steps to the studio, she could hear all the musicians practicing her music. The feeling overwhelmed her with excitement. Hearing the very notes that she had picked on her piano and music she had written played by Studio musicians somehow made it real. Agnetha signed with the CBS-Cupol label and her record topped the Swedish charts on Sunday, January 28th, 1968. Her first album released by Cupol was called Agnetha Fältskog. Agnetha still went on many folk park tours and she was even involved with a campaign to help young school childeren learn how to brush their teeth. She had written a special song, Borsta Tandtrollen Bort, which she sang at local schools around her hometown of Jonköping. This song was not a commercial release, but copies were pressed to give to the children. Her success continued throughout the late 60's with hit after hit. It was during this time that she met German songwriter/producer Dieter Zimmerman. They became engaged. Agnetha's records were reaching the German charts and Dieter promised Agnetha she could achieve great success in Germany. Agnetha went to Germany and met with record producers, she described their choice of material as ``horrible'' and she refused to meet their demands. Her career in Germany was short lived as was her engagement to Dieter. n 1969, Agnetha wrote and released a new single in Sweden named Zigenarvän. It was met with great controversy from the national newspapers. It was pure coincidence, but long after the song had been written, the Swedish were in a heated and nasty debate over gypsies living there and poor Agnetha was accused of exploitation. Another of her single releases Om tårar vore guld also turned into a controversy. A Danish band leader named Per, accused Agnetha of stealing the melody to one of his songs. He intended to sue her, stating that she must have heard the song when he had toured Sweden in 1950. When Per was told Agnetha was born in 1950 the lawsuit was quickly dropped. The year 1969 also brought a second album titled, Agnetha Fältskog Vol. 2. It was a major success and Agnetha had a place in history as one of Sweden's leading female vocalists. But something even greater than all of this was about to happen in the summer of 1969... she met Björn Ulvaeus, the man of her dreams, and the beginning of a musical collaboration between four wonderfully talented people. The groundwork for ABBA was being laid. Björn Ulvaeus was writing songs with Benny Andersson. They had both left their respective bands to work together. Benny had been seeing a girl named Anni-frid Lyngstad. Anni-frid also had a solo career at the time. Benny and Björn had formed their own company, Union Songs. They had a partner named Stikkan (Stig) Anderson. He was very anxious for them to sing songs in English. He felt they had all the makings of becoming superstars and for a Swedish act to achieve worldwide fame. In 1969, the personal lives of ABBA were taking shape. Benny and Frida had become engaged. Two months following this Agnetha and Björn were engaged. It was only a matter of time before all four would be performing together as a group. n 1970, Benny and Björn were working together as a duo. During this time both couples were living with their respective partners. The girls were both pursuing individual careers. In 1970, Agnetha put out her third album, Som Jag Är. The first occasion that all four performed together was when Benny and Björn were scheduled to appear in a restaurant in Göteborg, Sweden. Agnetha and Anni-frid decided to help out their boyfriends. They came up with the name Festfolk, which can mean party people or engaged couples. This performance was a total disaster. None of the performers were very interested in the songs they were performing and the audience noticed. uring 1971, the boys concentrated on their songwriting. After a suggesston from Björn, Agnetha tried out for a role in the theatre. She played Mary Magdalene in the Swedish stage version of Jesus Christ Super Star. Agnetha recorded the song, I Don't Know How To Love Him, and it became a smash hit for her. In 1971, Agnetha's fourth LP När En Vacker Tanke Blir En Sång was released. During this summer, Agnetha, Benny and Björn toured Sweden at concerts held in public parks. It was before one park performance that Björn and Agnetha happened upon an old Gothic church. They had been discussing marriage for several months, and this church was the one they had dreamt about. The only problem they encountered was when the pastor of the church asked what they did. They said they were artists, he thought they said atheists and refused to marry them. The misunderstanding was cleared up. On July 6th, 1971, Agnetha Fältskog and Björn Ulvaeus were married in the village of Verum in southern Sweden. Benny played the organ at their wedding. He played the Wedding March as well as a song he had cowritten called Wedding with Svenne Hedlund of the Hep Stars. The wedding drew large crowds and Agnetha was injured when a police horse stepped on her foot. The couple enjoyed a short honeymoon before going back on the road with the folk park tour. uring 1972, the four members of the future ABBA performed together on many recordings where Agnetha and Anni-frid were used as backing vocalists. At the end of 1972 Benny, Bjorn and Stig were approached by the Swedish Broadcasting company to submit an entry in the Eurovision song contest. The song they chose for the 1973 Eurovision contest was Ring, Ring. 1973 was not going to be their year, even though the audience loved Ring, Ring, the judges did not choose it. Stig Anderson believed in this song and he had Agnetha, Björn, Benny and Anni-frid record it in English, Swedish, German and Spanish. 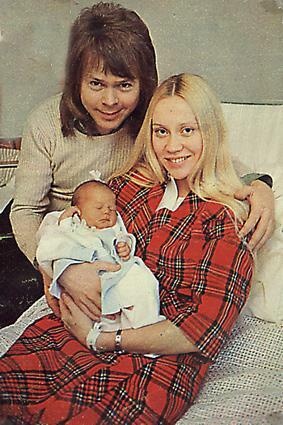 On February 23rd, 1973, Elin Linda Ulvaeus was born. After Linda's birth, Agnetha spent most of the next decade trying to be with her daughter on a full time basis. Although it was difficult for Agnetha to manage two careers, that of mother and singer, time has proven that she did a splendid job. In 1973, Cupol released her fifth Swedish language album, Agnetha Fältskogs Bästa. It contained a compilation of all of her previous albums. tig Anderson was really prepared for the Eurovision contest that would be held in Brighton, England in 1974. He was going to pick a fast paced title. With a lot of thought and planning he came up with the title Waterloo which he felt could be understood and pronounced by those who did not understand English. In the meantime Benny and Björn had written another good possibility, Hasta Mañana, but this song had been written with Agnetha in mind, and all agreed that the chosen song should include all four members. So it was to be Waterloo. The Swedish heat for the contest entry was on February 9, 1974. Waterloo won easily, taking 60% of the judges' votes. ABBA also decided to work on the visual part of their act. The director of the Eurovision orchestra was Sven-Olof Walldoff. He agreed to dress in a Napoleon outfit. ABBA's costumes were sequined and different from anything that they had previously worn. Bjorn even had a ``lucky'' guitar made in the shape of a star. ABBA wanted Europe to remember this performance! In the meantime, Stig had Waterloo released all over Europe. In addition to Bjorn's lucky guitar, Agnetha brought a stuffed donkey and Frida insisted on wearing a big floppy hat. On April 6th, The Eurovision Song Contest was held in Brighton, England. The contest was held in the newly refurbished Dome Theatre. Waterloo won, champagne corks flew and the celebration was on for ABBA. A very bright future lay ahead of them. Suddenly they had all kinds of promotional work to complete. Within a few weeks Waterloo had reached #1 in six countries. In America it peaked at #6 on the Billboard charts. May brought the release of the Waterloo LP. After all the success that ABBA had after winning the Eurovision song contest, they did extensive publicity for their album. They traveled to America and appeared on the Merv Griffin talk show. On Sunday, November 17th, 1974, they embarked on their first tour. The first stop was at the Falkonerteater in Copenhagen, Denmark. They played to a sellout crowd. During the next 13 days they visited West Germany, Austria, and Switzerland. Following this first leg of their tour they took a week off to go home to Sweden to be with their families. The next leg was to start on December 8th. They were to go to England for five shows. ABBA had not caught on with the English public yet and were considered one hit wonders by Britain's music critics. The cost of the show would be astronomical for ABBA. The transfer of equipment alone was very expensive. Because they did not feel like they were taken seriously in Britain they decided not go. The first two weeks had been disappointing with the exception of Denmark. ABBA were not selling enough tickets and were actually not making money, but instead going into debt. tage three of this tour turned things around. On January 10th, 1975, they started to tour Norway and Sweden. Success at last, there were sellouts at every stop. The tour ended in Umeå, northern Sweden on January 22nd, 1975. During the summer they played at Swedish folk parks and were so popular that many people had to be turned away. This salvaged ABBA's losing so much money during their first tour. They were very popular in Scandinavia, now they had to prove to the rest of the world, Britain in particular, that they were indeed not one hit wonders. 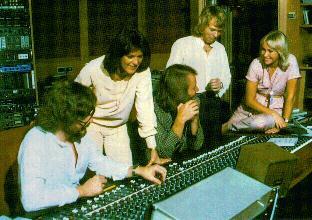 The first six months of 1975 found ABBA in the studio working on their second album, ABBA. The album contained 11 songs and was scheduled to be released in May. ABBA was recorded at Glenstudio and at Metronome Studio in Stockholm. Since Agnetha and Frida only went to the studio to record the lyrics they were free to do more solo albums. During this time Agnetha released her sixth album, Elva Kvinnor I Ett Hus. Agnetha had co-written all of the songs along with Bosse Carlgren, with the exception of one song, S.O.S., which was written for her by Björn and Benny. In the meantime, Frida was also working on a solo album titled, Ensam (Alone) with Benny as producer. One track on this album, Fernando, was written by Björn and Benny. 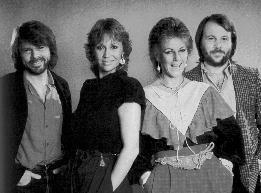 June brought the worldwide release of ABBA. The first single taken from the album was I Do, I Do, I Do, I Do, I Do. It was an immediate success in Europe. The British critics remarked, ``This song is so bad it hurts.'' 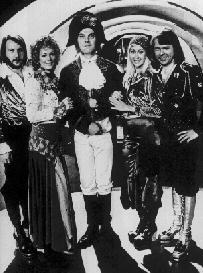 ABBA's popularity in eastern Europe caused the black market to enter the picture for fans that could not get the government allocations for the record. This enticed fans to buy the records at very high prices. The prices did not deter the eastern European fans. They loved ABBA. ABBA's fan club in Sweden was deluged with thousands of fan letters from Poland alone. During the same time, far away in Australia, ABBAmania was beginning to take place. Finally! Success in Britain was obtained by the release of the single S.O.S.. This song, not only made the British notice ABBA, but its success all over the world convinced ABBA's critics that they were indeed a force to be reckoned with. It remained in the British charts for weeks. S.O.S. was followed by Mamma Mia. Mamma Mia was the breakthrough single in Australia. The Australians were enamored with the group and a compilation album titled Best of ABBA was released only there. It sold over 850,000 copies in a country of only 14 million people. ABBAmania down under was happening! September 1975 found ABBA making an extensive promotional tour in the United States. The tour was to be two weeks long, but Agnetha was not happy leaving her daughter for that long of a period of time. Linda accompanied her parents to America. The long flight proved to be a taxing experience for this three-year-old. Agnetha was not only enduring her dislike for flying, but was also being torn apart inside over not being a good mother to her child. At the end of 1975, following the release of Elva Kvinnor I Ett Hus, Agnetha's contract with CBS-Cupol Records was finally fulfilled. Polar Music would no longer have to pay any percentage to CBS-Cupol for using Agnetha. In December of 1975, Agnetha had throat problems. She was diagnosed as having tonsillitis. The holiday break enabled her to go into the hospital and have her tonsils removed. It was a hard for her to quit, but Agnetha decided to totally give up smoking. he year 1976 brought a sustained success in Britain. Mamma Mia knocked Queen's Bohemian Rhapsody off of the charts after it was there for weeks. ABBA were asked to do Mamma Mia on Top Of The Pops, a British televised show that used it's own orchestra for backing artists. Benny and Björn did not like this idea so they brought three of their own backing musicians from Sweden. They were still not happy with the sound of the music. This began a tradition for ABBA, who were among pioneers using a new format, video. Videos provided ABBA the perfection that they wanted in addition to being a promotional tool used for telecasts. It also made traveling an option and gave the group more time to work on songs in the studio. Frida's solo version of Fernando was such a popular hit in Scandinavia that Stig decided that it needed to be translated into English and recorded by ABBA. During March 1976, ABBA made a promotional tour of Australia. In less than a year they would tour Australia. They were well received and they did a television show that attracted a larger audience than the moon landing in 1969. 1976 brought the release of ABBA's Greatest Hits LP. Most of this year was spent in the studio working on the next album Arrival. June 18th, 1976, was a special day for ABBA. This was the day before the marriage of Sweden's King, Carl Gustaf, and Silvia Sommerlath. A gala was held where entertainers from all over Sweden would perform for the new Queen to be. ABBA was the only pop act that was invited to participate. They performed Dancing Queen for the occasion even though it was not written for this event. In fact it had already been announced as a release six months earlier. The Swedish media criticised ABBA thinking that Dancing Queen had been written especially for this occasion. In November, Arrival was released. It was very successful. Earlier ABBA had announced a world tour which was to begin in 1977. They traveled to Britain, the United States, and Poland. ABBA's success behind the iron curtain was phenomenal. Stig Anderson had worked out deals with every Eastern European country, but insisted that ABBA not be paid in worthless rubles, but in US dollars. The only places that ABBA refused to sell albums to were Vietnam, North Korea and China. Arrival was enthusiastically received by music critics. In America, it was the first ABBA LP to be certified gold. The group spent the end of the year at home preparing for a very busy 1977, but an ugly rumour surfaced. It was reported that ABBA had been in a horrible plane crash and Frida was the only survivor. ABBA immediately tried to contact all of their representatives in record companies to quell this rumour. It was well known that Björn and Agnetha tried to avoid travelling together because they did not want to leave their daughter, Linda, an orphan. Before the beginning of 1977, ABBA assembled a group of musicians for the upcoming tour. Twelve musicians were selected. They were also busy assembling all of the equipment that would be needed for this event. Thirty tons of lighting equipment would be used during this tour. They were to be amplified through a 20,000 watt stereo speaker system. Another 40 people were needed to set up all of this equipment and to transport it around the world. The 1977 tour began in Europe. This first part of the tour was a great success. News from America were uplifting too. Not only was the Arrival LP gold, but during this year they would add The Greatests Hits LP and the single Dancing Queen to their golden collection. February marked the first time that ABBA were to play in Britain. Five shows had been scheduled. Demand for tickets at London's Royal Albert Hall were so great that ABBA added another show. The show itself was over 100 minutes long. ABBA used a helicopter sound as they appeared on stage. They packed just about everything they could into their performance, leaving out few songs. Among the new material there was one notable act, the mini stage production of The Girl With The Golden Hair. This mini musical was a fitting end to their performance. It was theatrical and well received by the audiences. It was at this time that a movie featuring ABBA was being considered. It was decided that if everything would go as planned, the group would not tour in 1978 because Agnetha would be busy caring for her new baby. This film would help if it detailed the 77 tour because no live appearances were planned for 1978. The film had been planned as a documentary and was already being shot in Britain. ABBA decided to include their mini musical in this film. When ABBA arrived in Australia, the most fanatical leg of their tour the decision was made to change the film from a documentary to a comedy. Swedish film maker Lasse Hallstrom, who was also the director of their promotional videos was selected to work on this project. This project became ABBA-The Movie. Most of the footage was shot in Australia during the first half of March. Sydney, Australia was the venue of the first concert in the last leg of the tour. There were torrential rains and a lot of thought was put into whether or not the concert should go on. The weather did not prevent most of the fans from arriving at the concert. ABBA did not wish to disappoint this audience so they decided to go forward with the show. All the precautions that could be taken were, but during one of Frida's dancing numbers she slipped and fell down. She was badly bruised but still went on with the show. The audience numbered more than 20,000. If ABBA had any doubts about how the Australians felt about them, they were already put to rest by this wet enthusiastic crowd. Tickets were sold out at all of the remaining shows in Melbourne, Adelaide, and Perth. An additional show was added because Stig did not want the crowd to be over 20,000 people because of safety reasons. He did not wish for any fan to be injured by too large of a crowd. In October, the single The Name Of The Game/I Wonder was released. These were the first two songs that would be released from the LP, ABBA-The Album. Within two weeks of it's release The Name Of The Game reached #1 on the British charts. It remained there throughout November. The end of 1977 was also when ABBA-The Movie was nearing completion. Agnetha was also nearing the end of her pregnancy. 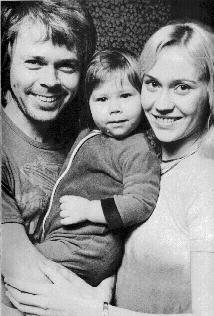 On December 4th, she gave birth to her second child, Peter Christian Ulvaeus, in a Stockholm hospital. Four days after his birth photographers were anxious to get pictures. On the same day as the pictures were released in the British newspaper, The Daily Express, another ABBA-related story was released, ABBA had overtaken the Beatles in record sales worldwide and had topped record charts in no less than 32 different countries. In April, ABBA traveled to France for the opening of ABBA-The Movie. The end of April found them traveling to Los Angeles for the promotion of ABBA month. Ten days ABBA found themselves totally dedicating themselves to promotion in the US. Stig, The Scotti Brothers, and Atlantic Records (ABBA's American record company), had come up with a spectacular promotional campaign that would ensure 100% exposure. Everything from advertisements, talk shows, radio interviews and even a huge billboard overlooking the Sunset Strip in Los Angeles. They were also here to be on Olivia Newton John's TV Special. Olivia had been a fellow contestant in the Eurovision Contest of 1974. Olivia also had achieved international success and was a big star in her own right. Before returning to Stockholm they also traveled to Germany. In Stockholm the renovation of Polar Studios had been completed. ABBA had built a studio that was modern and had no equal anywhere in the world. May also was the month of discussion about another upcoming world tour possibly taking place during the spring and summer of 1979. By June, Benny and Björn had completed six songs for the next album. During this month ABBA finally were able to get some much deserved rest and time with their family and friends. August found ABBA back at work in the studio. Also during August, Agnetha's own song-writing talents were honored by The Swedish Society of Popular Music. She was given an award for past solo compositions. An unexpected release of the single Summer Night City brought media attention. Never before had a song been released so far ahead of it being on the next album. Critics again did not like this song, saying that ABBA had finally succumbed to ``disco muzak''. Once again the record-buying public loved the song. ABBA did a promotional video, using Stockholm by day and night as a background. On October 6th 1978, Benny and Frida were married in Lidingö, Stockholm. The celebration was kept secret much to the consternation of the press. The remainder of the year found ABBA once more on the road in France, America, and Japan. In London it was announced that ABBA would participate in a charity concert for the United Nations International Children's Emergency Fund (UNICEF) spotlighting 1979 as the Year Of The Child. otally unexpected news began the year of 1979, Agnetha and Björn were seeking a divorce after eight years of marriage. Their relationship had been on rocky ground for quite sometime, although both partners were able to keep it secret. On Christmas Eve, Agnetha decided that she no longer wanted to feel the hurt of this relationship, and both partners agreed there was nothing more they could do except part. Björn moved out. ``The breakup had been coming for quite sometime. We just drifted apart, it's as simple as that. When you talk about everything and you still don't get through to one another, then it's a sign that there's really nothing left between you. I guess we would have separated whether we were pop singers or not, and we would have made the same decision, if it had meant disbanding ABBA,'' said Agnetha. By mutual agreement, Agnetha and Björn agreed to stay with ABBA. It actually was a relief for both of them and ABBA became stronger than ever. They both knew that the reports of their divorce would certainly spark rumors and speculation by the press. The following interviews were printed in one Swedish newspaper. Despite the above statements the press still sensationalized the divorce. Agnetha and Björn set out to prove that ABBA were very much still a group. On January 9th, 1979, they were in New York for the televised show for UNICEF. The Gift of Song Concert was held in the General Assembly Hall of The United Nations. Estimated television viewers were around 300 million worldwide. ABBA's gift of song was Chiquitita. They donated the copyright and the proceeds of this song to UNICEF. Following the UNICEF concert, Agnetha and Frida traveled back to Stockholm while Benny and Björn went on a vacation in Nausau, The Bahamas. During this time they wrote additional songs for the new ABBA LP. On their way back home they stopped in Miami to record the backing track to a new song, Voulez Vous. Benny and Björn returned to Stockholm refreshed and renewed, and went directly to the studio with the girls to complete work on their new LP. The new LP, Voulez Vous, was released on May 4th. It was a departure from anything previously recorded. The new LP had more mature themes and three of its tracks ran longer. Musically ABBA were also evolving into different sounds and they were beginning to add more instrumentation to the tracks. Eventually seven of the ten tracks were released as singles. One single, Gimme, Gimme, Gimme (A Man After Midnight) was just being finished in the studio when ABBA were about to leave for their world tour at the beginning of September. This new song was to be released while they were on tour. On September 13th, 1979 started the first leg of ABBA's tour in America. They opened in Edmonton, Canada followed by 13 other venues covering the United States and Canada. Even though not every single performance was sold out, ABBA had sold out most performances and they were met with so much enthusiasm at each performance that often an encore was necessary . The show totaled 24 songs. One of the most notable songs for Agnetha fans was I'm Still Alive. She not only wrote the lyrics but also played piano for this part of the concert. In Los Angeles, all of ABBA's children met them for a wonderful day spent at Disneyland. After their performance at the Anaheim Convention Center there was a large press conference held. Agnetha left early so she could spend time with her daughter Linda. At the Aladdin Hotel in Las Vegas, the audience was given a special treat when Linda joined the children's choir for the song I Have A Dream. After Las Vegas, ABBA spent another day in Los Angeles with their families, before traveling to the east coast. While in Boston, Agnetha became quite ill with a severe cold and the last US performance in Washington D.C. had to be cancelled. She did manage to go ahead with the final two concerts in Canada. At both concerts, Agnetha received a special welcome when she appeared on stage. On October 18th, 1979, ABBA returned to Stockholm to rest before continuing on in Europe with the final leg of the tour through Sweden, Denmark, France, Holland, Germany, Switzerland, Belgium, England, Scotland and finally Ireland. On October 26th, 1979, ABBA released ABBA Greatest Hits Vol.2. After more than 40 concerts in ten countries, ABBA were finally able to rest. Agnetha in particular was pleased to be back at home with Linda and Christian. Speculation had Agnetha leaving ABBA, but this was not what she wished, she only wanted to be near her children and not tour anymore. She still wanted to do studio albums and remain in ABBA. She did request some time away from the group in the latter part of 1980 because this was when Linda would be starting school. A compilation of Agnetha's Swedish recordings was released in 1979, Tio År Med Agnetha. s the new decade dawned, ABBA were once again ready for work. Benny and Björn who were having a bit of a dry spell with their music returned to Florida and warm weather to overcome their creative slump. Chiquitita had been a tremendous success in Spanish speaking territories and Agnetha and Frida were spending all the time necessary to redo some vocals for some of ABBA's best known songs. Benny and Bjorn returned from a successful trip in Florida to Polar Studios in time to remix the background music for a new release, an LP, Gracias Por La Musica. In March, ABBA traveled to Japan for three weeks to perform in eleven concerts. The concerts were exactly the same line up as the 79 concert tour except ABBA sang I Have A Dream in Japanese, much to the delight of their audiences. Back in Sweden, the group set forth to record a new LP, Super Trouper, which was released on October 31st, 1980. Earlier in July the hit single, The Winner Takes It All was released as the first single of the upcoming LP. A highly acclaimed video was released at the same time. Super Trouper proved to be the first ABBA LP that did not meet with any negative criticism. In November, all members took a needed break. During this time Agnetha realized a much desired dream to do an album with her daughter Linda. The LP consisted of eighteen traditional Christmas carols and children's songs, in Swedish. Agnetha together with Michael B. Tretow produced the album. ABBA had made numerous plans to do Christmas specials for television, but they were suddenly put on hold. A note had been delivered to Polar Music offices in Stockholm threatening the safety of ABBA and their children. A distraught Agnetha stated, ``Whoever's writing the notes said that if we went on tour, they'd hurt our children.'' After being advised by police to remain in Stockholm, ABBA regretfully cancelled all travel plans. Show Express, a German television program, sent a crew to Stockholm so that all members could stay safely in Sweden as the program was recorded. n January 14th, 1981, a secret wedding service was held in a church in Stockholm. Björn and his girlfriend Lena were married. On January 25th, Stig Anderson celebrated his fiftieth birthday. A party was planned with over 300 guests and ABBA performed a special song written for the occasion, Hovas Vittne. On February 10th, Benny and Frida announced to the press that they were seeking a divorce. They also announced that this would in no way interfere with their part in ABBA. ABBA would remain a group once again trying to avoid any negative publicity about ABBA breaking up. Surely if ABBA survived one divorce it could survive two. Frida made a very similar statement to the press as Agnetha had back in 1979. Another interview revealed that as long as everything was fun for all of ABBA, they would continue to stay together and record music. Their newest LP, The Visitors was nearing completion. It was released on November 30th, 1981. This was ABBA's ninth and final LP. The songs were quite adult oriented and it was very apparent that the group were expressing personal feelings with this newest release. The album cover itself summed it all up, no one on the cover is looking at the other. The cover photograph showed no happiness at this point but the music itself was nothing less than brilliant. ABBA had once again evolved in their musical abilities. This LP was more rock than pop and was the pinnacle to their career. At the end of 1981, Agnetha and Linda's LP, Nu Tändas Tusen Juleljus, was released in Sweden. 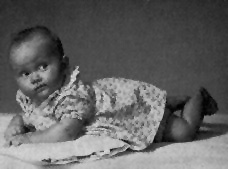 n January 3rd, 1982, Björn and Lena's first child, Emma, was born. Exactly one week later on January the 10th, Benny and new wife, Mona also had a child, Ludwig. Agnetha and Tomas Ledin, a backing singer for ABBA, made a single together titled Never Again. ABBA were still moving ahead with plans for yet another album. A few songs were ready for release in 1982. October brought the single, The Day Before You Came/Cassandra. Later in the year, Under Attack and You Owe Me One were released together on a single. This was their final single and video. A double compilation LP, The Singles-The First Ten Years was released. The last few ABBA songs were also beginning to show how much ABBA were, again, evolving into another phase. The Day Before You Came, exemplified this. Agnetha was the lead vocal on this song about a woman who did not realize just how mundane her existence was until, a man entered her life. The video that was used to publicize this song was very out of the ordinary for the ABBA that all fans had become accustomed to seeing. For the first time, Agnetha was given a role that she could put her acting talent into. This was different from any other previous ABBA video. The video for Under Attack also showed this new side of ABBA. The year was 1982, this would be the last song of ABBA's to be released. There was never a formal mention of ABBA breaking up. It was explained at the time as a rest. The group were all off doing individual things, but were expected to be together again in the recording studio. Benny and Björn were interested in doing a musical with Tim Rice titled Chess. Agnetha and Frida were both pursuing solo careers. In the year 1996, all were back on the charts, Agnetha with her compilation of favorites, My Love My Life, Frida with Djupa Andetag, and Benny And Björn with the highly successful musical, Kristina från Duvemåla. n January 20th 1983, Agnetha was busy making her first English solo album, Wrap Your Arms Around Me. She wanted a sound that was different from ABBA. Mike Chapman who was a famous producer, Blondie being one of his acts was called upon to work with Agnetha on this album. He had heard of her and was most happy to oblige. Since he wanted Agnetha to be comfortable with this effort he enlisted help from many of the musicians and backing vocal artists that were with ABBA. He went to Stockholm to produce this album and work at Polar Studios. Together Agnetha and Mike picked all of the songs. By April, the album was completed and Agnetha started on a promotional tour. In May the album was released worldwide with the single The Heat Is On. Agnetha's promotions took her all over Europe and a visit was also made to America. She arrived in New York on August 22nd and stayed 7 days for promotional advertising on radio. Can't Shake Loose climbed to #5 in the Billboard charts. The album was very successful in Europe. It sold over 2 million copies. 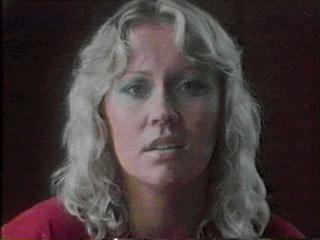 Agnetha also promoted her album with many TV appearances. On September 30th, 1983 Agnetha traveled to London to promote her new single Can't Shake Loose. This trip brought a lot of trauma for Agnetha. She fell down some steps and cut her elbow while making an appearance on Noel Edmonds Late, Late Breakfast Show. She was in pain but still went on to sing. This was the first of two events that may have left Agnetha wishing she had stayed at home. For many years it was a known fact that Agnetha feared flying. She loved to travel as much as possible by bus or by boat. On her way back home in Sweden, the bus she was riding in turned over after the driver lost control and Agnetha was thrown from the back into a ditch. Luckily no one was injured badly, but Agnetha was hospitalized overnight after receiving treatment for shock, cuts and bruises. This experience reinforced Agnetha's distrust of the press. At the end of 1983, Agnetha released the single It's So Nice To Be Rich/P&B. This single was released exclusively in Sweden and was part of a movie sound track. It topped the Swedish charts. The year 1984 for the most part was out of the public eye. Agnetha spent all of the time she could caring for and being with her children. In May, she did do a Swedish Television special, Jönköpingsyra, commemorating the 700th anniversary of her home town. Agnetha hosted this special as one of Jönköping's most famous citizens. A children's choir surprised her with a medley of her pre-ABBA solo songs. Near the end of this year Agnetha was ready to work on a new album. This time the collaboration was with Eric Stewart of the group 10cc. The beginning of 1985, found Agnetha back in Polar Studios laying down the first tracks to her new English solo album, Eyes Of A Woman During the last of March, Agnetha released one of her own compositions as a new single I Won't Let You Go. The following week, the new album was released. It met with great success throughout Europe. Sales for this LP were very good. This album was never released in America, but a 12" extended version of One Way Love did make it to America where it was very popular in dance clubs. To help promote the album in Europe, Agnetha appeared at the Montreux Pop Festival and did a half hour television special filmed in Stockholm. The special was named, A is for Agnetha, and on it she performed five songs from her album. In addition, Agnetha spoke about her life past and present. In June, Agnetha gave her last interview in the newspaper Expressen. She again decided to spend time with her children. She took the following year off as well with the exception of a new single release on November 10, 1986. This was the first release from her own recording company, Agnetha Fältskog Productions AB. The single The Way You Are/Fly Like An Eagle was a duet sung with a long time friend Ola Håkansson. It was for the film It's Time For Sweden. The single became a top ten hit in Sweden. A few television appearances were made throughout Sweden, but little or no promotion was made for the rest of Europe. As the year was closing, Agnetha signed a contract with WEA to do her third English solo album. In 1986, Cupol released another compilation of Agnetha's solo Swedish songs. The title of the LP was Sjung Denna Sång. The beginning of 1987 also brought another album from her. She recorded a Christmas album with daughter Linda in 1980 and was now recording a new album with her son, Christian. The title is Kom Folj Med I Vår Karusell. The album was recorded at Sonet Studios in Stockholm. This album contains 16 children's songs and was produced by Agnetha and Michael B. Tretow. One song from the album was released as a single, På sondag. It was a success with Swedes of all ages. The album, I Stand Alone was produced by American artist Peter Cetera. Agnetha and Peter met during a telethon in Stockholm. During their first meeting Peter suggested to Agnetha that soon they should work together. Agnetha did not really take this offer seriously because in the music business many people have good intentions that never make it to reality. ``However, to my surprise Peter and I started trans Atlantic communications about the project soon after we had met and we never let the idea die.'' Peter returned to Stockholm to help choose songs for this new album with Agnetha. For the first time Agnetha would not be surrounded by studio musicians whom she knew. She went off to America to work at Chartmaker Studios, in Malibu, California. Although she hated to fly and to leave her children, Agnetha agreed to spend five weeks in America to do this album because it's producers, Peter Cetera and Bruce Gaitsch, wanted to use musicians and a studio that they were used to. I Stand Alone debuted in Sweden on November 9th, 1987. It soon topped the charts selling over 170,000 copies. Agnetha did promotional work for this album by doing an interview and performing four songs from the album on a Swedish television show hosted by Jacob Dahlin. The date of worldwide release was January 15th, 1988. The single released was The Last Time and Agnetha went into a studio and made a video for this song. The album was well received by its audience and praised by critics. Sales approached two million copies. Agnetha went to England to be on the BBC talk show Wogan, where she was given a wildly enthusiastic welcome from the audience. She also did many newspaper interviews. The following is a quoted text from one interview. This was the end of her career for a while. She remained devoted to raising her children. On Saturday, December 15, 1990 Agnetha married a Swedish surgeon, Tomas Sonnenfield. The Swedish press knew nothing about the marriage until a small announcement appeared in the paper the following day. This marriage did not last. In 1993, divorce proceedings were started by both parties. Since 1988, Agnetha seemed to shy away from the music business. It was not until 1996 that fans were given any hope that Agnetha might continue on with her career. Early in 1996, Sony Music announced that Agnetha was doing a double CD album, My Love, My Life. Although no new material was to be made for this album, Agnetha was busy picking music that she loved. It took a while for this CD to finally all come together. On September 24th, 1996 My Love, My Life was finally released. This was not the only good news. Agnetha decided she wanted to finish a book that she had started back in the 1980's with Brita Åhman. The name of this book is Som Jag Är. Its release coincided with the release of her new album. I have been a fan of Agnetha for over 24 years. I am so glad that she is back. I look forward to the future with renewed optimism. Agnetha, you have been away too long. All I want to say is welcome back from all of us who for years have admired your talent. You were never forgotten, but held in our hearts forever. And if I may use the title of one of your songs, Agnetha stay the way you are. Watch this space for continuation of Agnetha's Bio! Palm, Carl Magnus ABBA The Complete Recording Sessions. Great Britain: Century 22 Ltd., 1994. Tobler, John ABBA Gold The Complete Story. Great Britain: Century 22 Ltd., 1993. Snaith, Paul ABBA The Music Still Goes On. Surrey, England: Castle Communications Plc, 1994. Åhman, Brita Som Jag Är. Stockholm ,Sweden: Norstedts Förlag AB, 1996. These books are are highly recommended for reading more on ABBA. They can be ordered through most larger book chains.